Curated by Régine M. Roumain, Executive Director of HCX, this year’s festival is an ode to artists, inspired by Haiti’s revolutionary spirit. Beginning May 6 and ending June 29, 2018, Ayiti ANGAJE/Atis ANGAJE presents talent whose artistic practice is rooted in social justice. Through creativity, expression, and community, this two-month festival will bring together over thirty emerging, mid-career and established artists to present their work in mainstage and community venues in Brooklyn and Manhattan. Delsoin, who began his dance studies in Haiti, followed by training at the National School Dance of Jamaica, and the Alvin Ailey American Dance Center among other prestigious institutions, had international dance credits with American choreographer Kevin Iega Jeff’s Jubilations!, and a two-year Latin American tour with Dominican singer Angela Carrasco. In 2004, after directing other dance projects, he ventured out on his own to form the Jean-René Delsoin Dance Center, as well as a company project now called the Compagnie de Danse Jean-René (COJRD). COJRD brings the richness of cultural expression and dances in Haiti to the world. It aims to bridge diverse communities worldwide by creating and producing dances of the highest level of artistry and versatility. For Mr. Delsoin, dance is as borderless as the dancing body is both particular and universal. Dance is accessible to all: its messages resonate in Haiti and in all reaches of the globe. 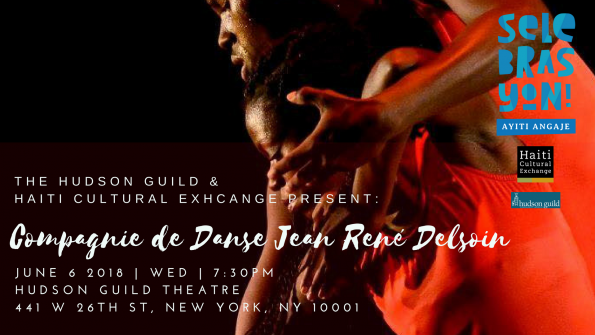 Forty-five works by Mr. Delsoin and five choreographers from Haïti and abroad utilize modern, jazz and contemporary dance techniques alongside traditional Haitian dance. These dance performances explore quotidian practices and concerns in Haiti alongside universal themes. The fusion of techniques in COJRD champions the vision of a contemporary Haitian who nurtures his traditions and mores while living in the present and embracing what the future holds. For more information on Selebrasyon! and sponsorship opportunities please contact Haiti Cultural Exchange at 347-565-4429 or email info@haiticulturalx.org. This entry was posted on Wednesday, April 25th, 2018 at 2:26 pm	and is filed under Uncategorized. You can follow any responses to this entry through the RSS 2.0 feed. You can leave a response, or trackback from your own site.